Ty Dolla $ign & B.o.B cover the latest issue of RESPECT. | RESPECT. 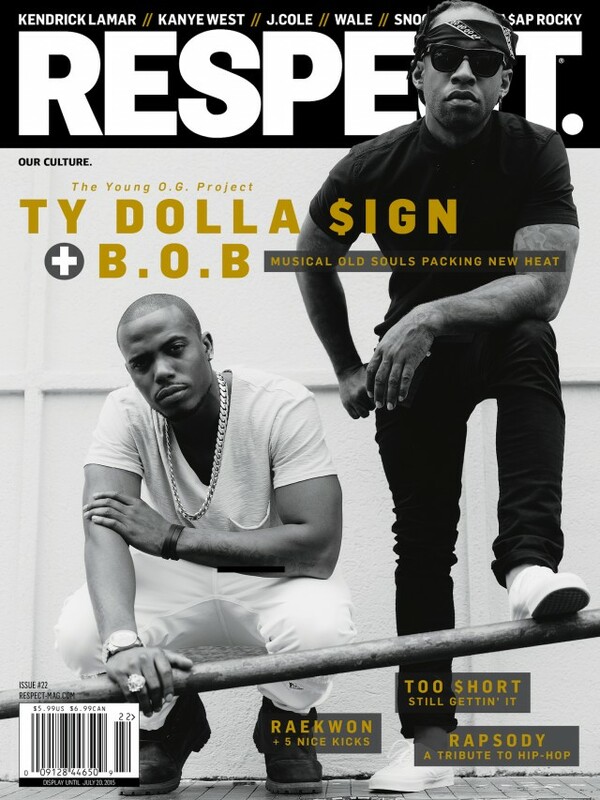 Ty Dolla $ign & B.o.B cover the latest issue of RESPECT. In the latest edition of RESPECT., hip-hop artists/producers Ty Dolla $ign and B.o.B headline the ‘Young O.G.’ themed project. In their feature, the two go beyond the shades, mean mugs and turnt up catalogs to share their complex musical knowledge, talents and inspirations. North Carolina bred emcee Rapsody shares her thoughts of being featured on Kendrick Lamar’s critically acclaimed To Pimp a Butterfly album, Too $hort remains all about the money, and Raekwon the Chef flexes in Nice Kicks while explaining why he gets better with time. Also see Nick Cannon, Fetty Wap, Love & Hip-Hop: Hollywood’s Sincere Show, Empire’s V. Bozeman, actress Reagan Gomez, and others sharing their perspective on hip-hop. RESPECT. Issue #22 on sale May 12, 2015.